Systems of record (SORs) are engines that generates value for your business. Systems of engagement (SOE) are always evolving and generating new customer-centric experiences and new opportunities to capitalize on the value in the systems of record. The highest value is gained when systems of record and systems of engagement are brought together to deliver insight. Systems of insight (SOI) monitor and analyze what is going on with various behaviors in the systems of engagement and information being stored or transacted in the systems of record. SOIs seek new opportunities, risks, and operational behavior that needs to be reported or have action taken to optimize business outcomes. Systems of insight are at the core of the Digital Experience, which tries to derive insights from the enormous amount of data generated by automated processes and customer interactions. Systems of Insight can also provide the ability to apply analytics and rules to real-time data as it flows within, throughout, and beyond the enterprise (applications, databases, mobile, social, Internet of Things) to gain the wanted insight. Deriving this insight is a key step toward being able to make the best decisions and take the most appropriate actions. Examples of such actions are to improve the number of satisfied clients, identify clients at risk of leaving and incentivize them to stay loyal, identify patterns of risk or fraudulent behavior and take action to minimize it as early as possible, and detect patterns of behavior in operational systems and transportation that lead to failures, delays, and maintenance and take early action to minimize risks and costs. IBM® Operational Decision Manager is a decision management platform that provides capabilities that support both event-driven insight patterns, and business-rule-driven scenarios. It also can easily be used in combination with other IBM Analytics solutions, as the detailed examples will show. IBM Operational Decision Manager Advanced, along with complementary IBM software offerings that also provide capability for systems of insight, provides a way to deliver the greatest value to your customers and your business. IBM Operational Decision Manager Advanced brings together data from different sources to recognize meaningful trends and patterns. It empowers business users to define, manage, and automate repeatable operational decisions. As a result, organizations can create and shape customer-centric business moments. 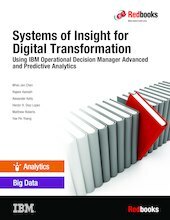 This IBM Redbooks® publication explains the key concepts of systems of insight and how to implement a system of insight solution with examples. It is intended for IT architects and professionals who are responsible for implementing a systems of insights solution requiring event-based context pattern detection and deterministic decision services to enhance other analytics solution components with IBM Operational Decision Manager Advanced.